Whether it be death by solar storm, death by an unseen comet or death by planetary alignment, I thought I might celebrate with some matching nail art. For my apocalyptic nails, I created a galaxy design using a black base and sponging on random bits of light blue, dark blue and purple. Then I put a thin layer of a holo silver glitter. 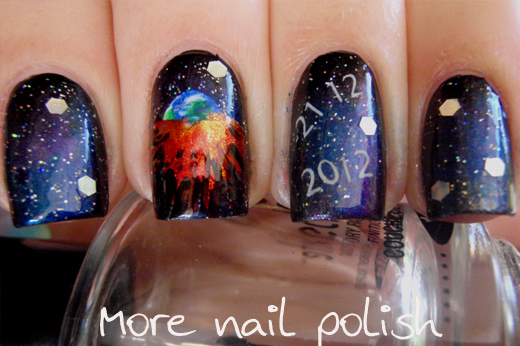 In case you were wondering, the middle finger is the earth blowing up, maybe after the comet impact or the solar storm. I painted it freehand using Ulta3 Blue Marlin, Frog Prince and Lily white the explosion is with Kleancolor Metallic mango, metallic yellow and Pretty Serious Santas Sunburn. On my ring finger I stamped today's iconic date. 21.12.2012. Here is Australia we always put the day first, then the month - although I know that is back to front for many. I got the numbers from the plate numbers at the bottom of the Bundle Monster plates. Lastly, I placed some silver holographic hexes randomly on my nails, they look a bit too big in these photos, but in real life they are just right. Are you doing anything exciting for the end of the world? I admire your painting skills. Impressive. LOL ... very clever nail art!!! very clever, that is super cool Kitties26.... I bought my Christmas pudding on the assumption we are actually going to have a Christmas!! Omg awesome! Your mani looks perfect! 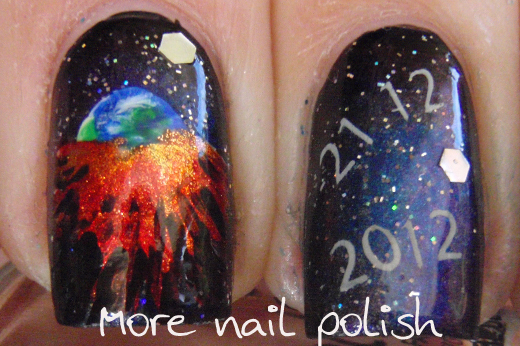 I did a comet about to crash into earth as my end of the world mani, your nails show what would happen next I guess! 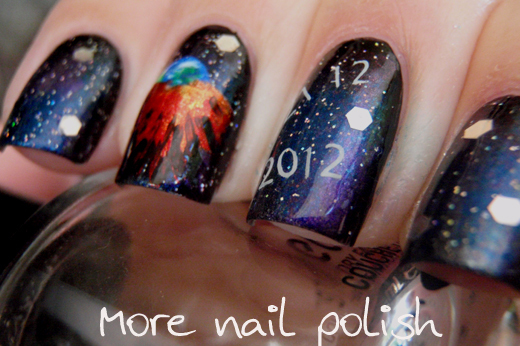 Phew, gladly we all are still here to look at this manicure ;) It is great, love the theme and your take on it! wow that middle finger is crazy! 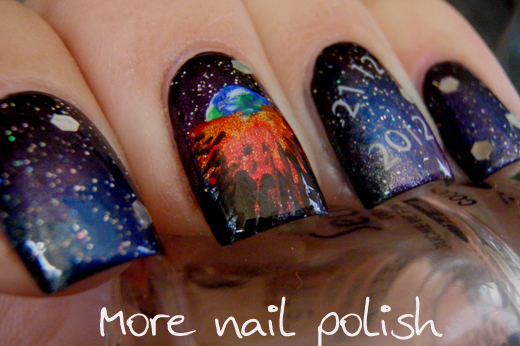 I love this mani - especially the explosion! LOL I love this manicure!!! This is very creative and looks great! That accent nail looks so funny!